With 4K / Ultra HD breaking into the mainstream both in computer monitors and televisions, you might be wondering what the capabilities of the four most popular connection types are, and which you should use. Welcome to our guide on the merits and pitfalls of HDMI, DVI, DisplayPort and good ole’ VGA. Learn what’s new, what’s old and what’s just straight-up outdated. These days, virtually all TVs and computer monitors support an HDMI connection. HDMI, which stands for High-Definition Multimedia Interface, shoots both digital audio and video down the same cable. Chances are, if you are trying to connect something to your television – and that includes computers – you’re going to want to use HDMI. HDMI is used in a very broad array of consumer electronics products, including laptop and desktop computers, mobile devices, the Chromecast dongle, Roku’s streaming stick, Blu-ray players, HD cable boxes, and much, much more – so it’s a familiar and appealing format for most folks, and easily the most popular among general consumers. Until very recently, HDMI v1.4 was the standard by which consumer electronics companies operated. There’s a good chance that all of the gear in your home is HDMI 1.4, but you should know that there’s a new version out, called HDMI 2.0, which takes HDMI’s capabilities to the next level. After the introduction of 4K/Ultra HD televisions came HDMI 2.0. HDMI 2.0 can pass video signals with a pixel resolution of 3820 x 2160 at up to 60 frames per second along with up to 32 channels of uncompressed multichannel digital audio, all through the same high-speed HDMI cables that have been around for years. That’s right: nothing about the cables or connectors has changed, only the hardware you connect them to. So there’s no need to expect to have to buy a bunch of new cables if/when you decide to upgrade. You can learn more about the latest version of HDMI right here. Since HDMI has progressed to this new version, there’s now even less reason to go with any of these other types of connections, except in some very specific situations, which we cover below. A digital display interface developed by the Video Electronics Standards Association (VESA), DisplayPort isn’t an option for consumer-level HDTV use (unless you plan on owning Panasonic’s top-of-the-line 4K TV, which is the only consumer television we are aware of that supports DisplayPort). However, DisplayPort is a perfectly capable option (some would say preferred) for connecting your PC to a computer monitor. With all of the necessary hardware add-ons and software updates, DisplayPort version 1.2 offers a maximum resolution of 3,840×2,160 at 60 FPS, which makes it ready to tackle 4K/Ultra HD content, and passes digital audio as well – just like HDMI. 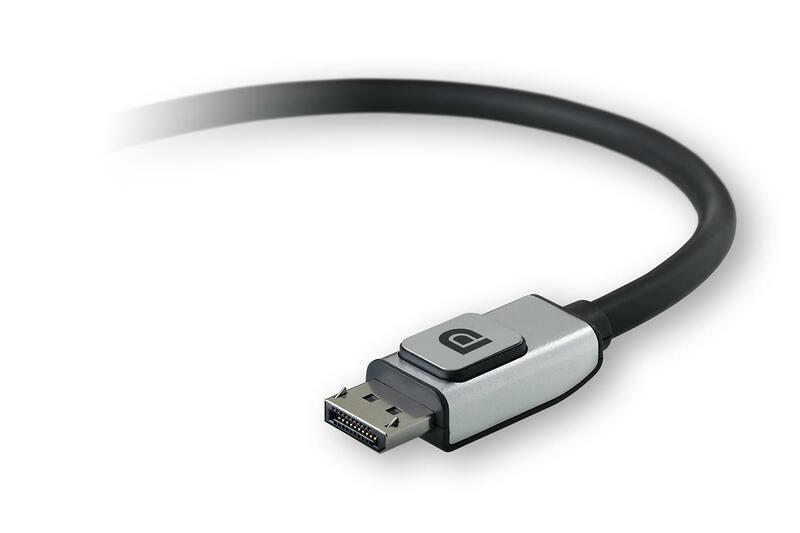 Despite HDMI’s prevalence today, DisplayPort boasts a couple of features that position it as a direct alternative – one that has earned its own cult of enthusiasts that swear by the connection type. Chief among them is DisplayPort’s multi-monitor capabilities, which make the format an excellent choice for graphic designers, programmers, and anyone else working with computers all day. Users can daisy-chain up to five monitors together in order to better streamline their working habits. There are many applications for such a setup – perhaps the most obvious and useful is the ability to reference material on one screen while typing on another, eliminating the constant alt-tab madness. While the current version of DisplayPort is 1.2, VESA recently announced plans to issues 1.2a, which is meant to tackle graphical tearing and stuttering problems by integrating something called Adaptive-Sync. The new technology will attempt to eliminate the problem by aligning a computer’s hardware to match up the system’s GPU with the monitor’s refresh rate. Adaptive-Sync is also rumored to be able to draw down refresh rates for less demanding tasks, possibly resulting in decreased power consumption. 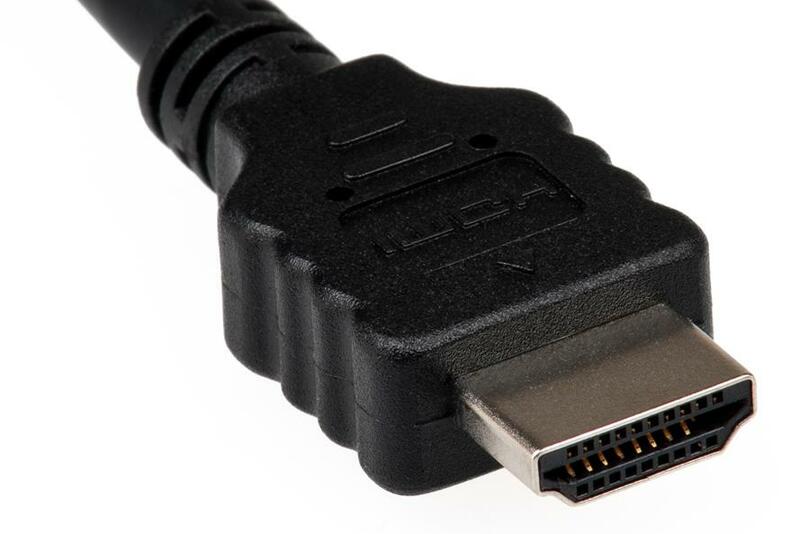 DVI (Digital Visual Interface) rose to prominence as the standard display connection format around 1999, but over time HDMI has effectively replaced it. DVI is designed to deliver uncompressed digital video and can be configured to support multiple modes such as DVI-D (digital only), DVI-A (analog only), or DVI-I (digital and analog). The digital video signal passed over DVI ends is essentially identical to HDMI, though there are differences between the two formats, namely DVI’s lack of an audio signal. You won’t find DVI on HD televisions or Blu-ray players anymore, but you wouldn’t want to use DVI for your flat screen TV anyway, since additional audio cables would be required. But for computer monitors, which often lack speakers anyway, DVI is still a popular option. You’ll also find DVI connectors on some older projectors, usually hiding in some dusty corner of an office. If you want 4K, though, you’ll need to go with HDMI or DisplayPort. 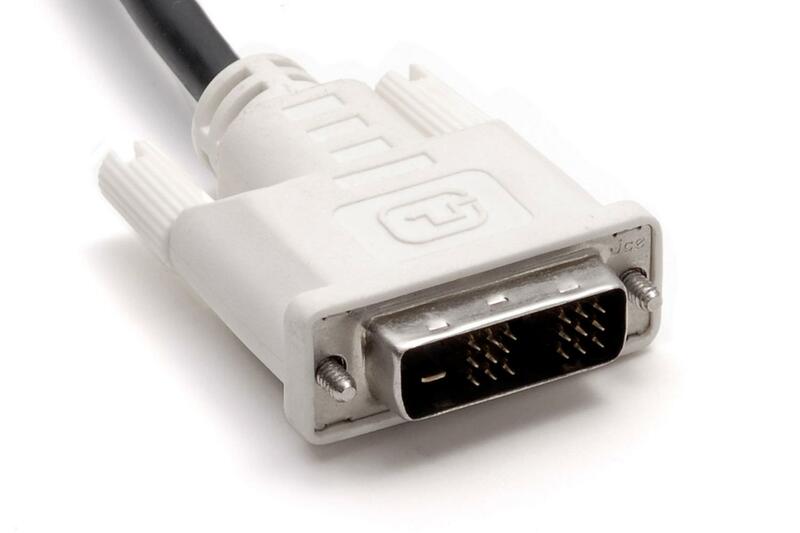 There are two different types of DVI connectors, single-link and dual-link. The dual-link DVI connector’s pins effectively double the power of transmission and provide higher speed and signal quality. For example, an LCD TV using a single-link DVI connector can display a maximum resolution of 1920×1200 – dual-link’s maximum for that same screen is 2560×1600. Once the industry standard and now a video connector with one foot already out the door, VGA (Video Graphics Array) is an analog, video-only connection that’s rarely seen on TVs anymore, though you’ll still find it lingering on older PCs and projectors. At the end of 2010, a collective of big tech companies such as Intel and Samsung came together to bury VGA, announcing plans to abandon the format and speed up their adoption of HDMI and DisplayPort as default interfaces for PC monitors. We don’t recommend going out of your way to use VGA, but if it’s all you’ve got laying around – and you’re not particularly picky about picture quality – it will do in a pinch. 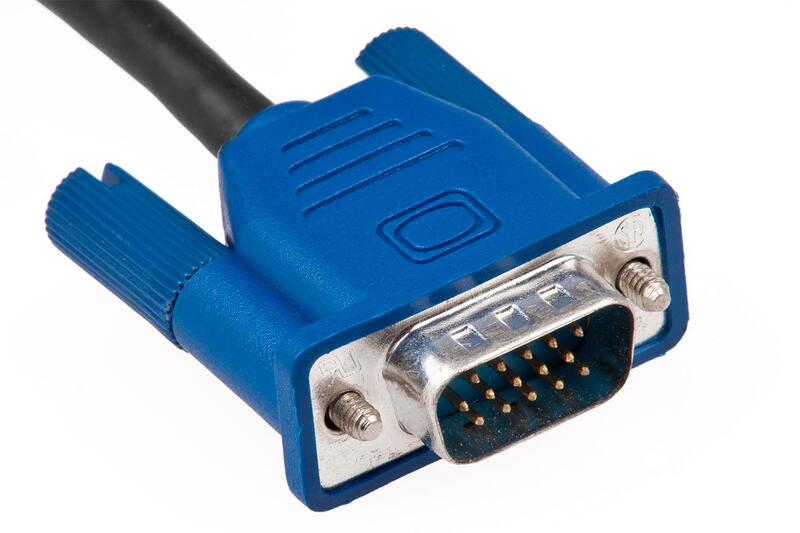 Sometimes the 15-pin connector is referred to as “PC-RGB,” “D-sub 15” or “DE-15,” and some laptops and other smaller devices come with mini-VGA ports onboard, in place of the full-sized VGA connector. If you’re connecting to a television, HDMI is the way to go. If you’re a gamer or find yourself on a computer all day, DisplayPort might be your best option, especially now that it has become more popular and, thus, supported. DVI and VGA are still solid computer monitor connections, but VGA is limited in its image quality potential, and won’t be a topic of conversation much longer. At the end of the day, we stand behind HDMI and DisplayPort as the top connections of choice.